If there is a secret, magical place at this end of the Province, this is it. This remote, pristine lake, deep in the remote backwoods, was originally home to a private hunting and fishing lodge, known as Birchdale, used by the rich and famous. For many years it was the home of Catholic monks, seeking solitude and isolation, known as Nova Nada. Today it is a privately owned facility used for conferences and retreats. But in the winter, it is indeed a place of quiet and solitude, broken only by the distant rumble of four-wheelers and other backwoods explorers. Still, it was a great treat for the ears and the eye. Sony A-900 – Sigma 24-70mm – f 2.8 – 45mm – ISO 200 – f19 – 1/90. 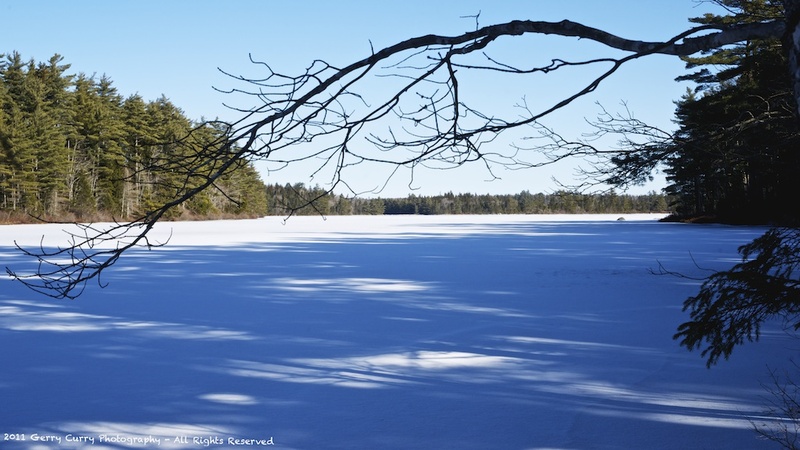 This entry was posted in Ice, Lakes, Landscapes, Trees, Winter and tagged clare district, Digby County, Ice, Lakes, landscape, nova scotia, Winter. Bookmark the permalink.